The conference site is in the very very heart of the city, on one of the seven hystorical hills on which Rome was founded (the Esquilino Hill), a few steps from Fori Imperiali and the Coliseum and side by side to the old church of S. Pietro in Vincoli (a church dedicated to St.Peter as a prisoner: "in vinculi" means: "in chains"), where the famous Michelangelo's masterpiece "Moses" is kept as a part of the never finished tumb of Pope Julius II Della Rovere. As a point of fact the Faculty is built in the area of the St. Peter's old monastry, built, in its turn, on the ruins of Nero's imperial palace known as Domus Aurea (that is: Golden House). 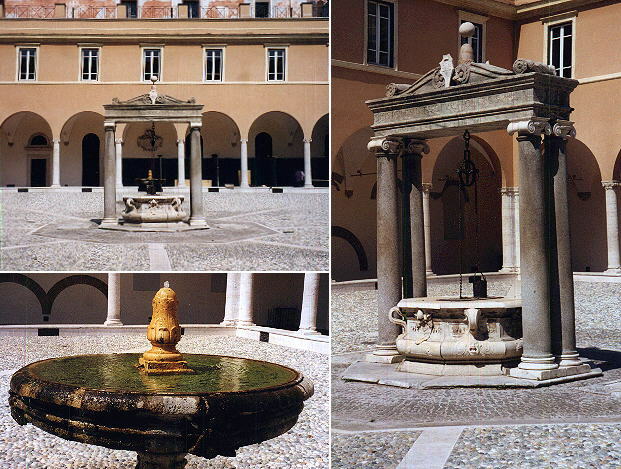 The cloister of the Faculty belongs to the old monastry and was designed by Giuliano da San Gallo: it is a magnificent example of Reinassance architecture in Rome. In the centre of it there is the 17th century well, now become the symbol of the school. The old refectory, recently restored, is used for the most important ceremonies in the life of the Faculty. If you are near the Coliseum you can take the moving staircase inside the underground station, go up to Largo della Polveriera and then turn on the left towards Piazza San Pietro in Vincoli. If you are in Via Cavour (at the underground station) you can climb the stairs to San Pietro in Vincoli. By car It's the worst way to get to the University: it's very difficult to find a car park and the fines are very expensive. Bus and underground tickets can be used for 75 minutes in the entire transport net. You can buy them in Newagents, Tobacco Shops and Undeground Stations. Many buses stop near the faculty, both on Via Cavour (routes '11' and '27') and by the Coliseum (routes '81', '85' and '87'). You can take the routes '30/' and '13' which stop near the Coliseum. Two underground stations on the B line can be used: the Cavour station, on via Cavour at the foot of the Esquilino Hill, if you arrive by train at the Termini station (just one stop apart) and the Coliseum (Colosseo) station if you come from the Fiumicino Airport "Leonardo da Vinci" using the train stopping at Ostiense (via the underground station Piramide). From the airport you can take a train either to "Stazione Termini" (Rome central station) or to "Stazione Ostiense". There is a train every hour to Termini station and a train every 20 minutes reaching all the following stations: Trastevere, Ostiense, Tiburtina. The regular train service starts at 6 am and stops at 10 pm.